Hi, and happy weekend! 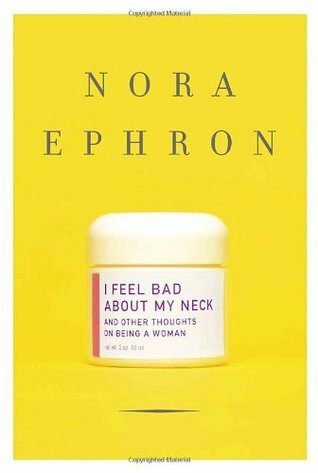 If you haven’t heard of her before, Nora Ephron is the writer of two of my favorite movies of all time: You’ve Got Mail and Sleepless in Seattle. Meg Ryan and Tom Hanks being adorable, basically. I’d looked at some of her books before, but had never gotten around to actually, ya know, reading them. But since I’ve had next to no time to read lately, I thought a super short, funny collection of essays could be just the thing for me. It was completely the thing I needed. She made me laugh, she made me think, and she made me nod my head in complete agreement. I will say though, that I didn’t know I Feel Bad About My Neck was about getting old, going in, but even that ended up being fine. Sure, I don’t have a flabby neck or kids, but that doesn’t mean I won’t some day! I loved this book. You’ve made me want to read it again. And, yes, even though there is a lot in here about ageing, there are also so many great things to think about. Besides our necks. 🙂 I love the quote on reading. I also thought the things she had to say about changes in parenting over the years was interesting. Glad you liked it! It was so funny! I feel like I flew through it ! Oh my word. I need to read this. Because PURSES. My purse is always a bottomless abyss that eats my keys regardless of size. HA, the other day I frantically emptied everything in my bag looking for my keys, only to realize … they were in my lap the whole time. OOPS! I loved this book! If you ever want to re-read it, I highly recommend the audiobook version – it’s so nice to listen to her read these essays – it’s like a nice chat with a hilarious friend!